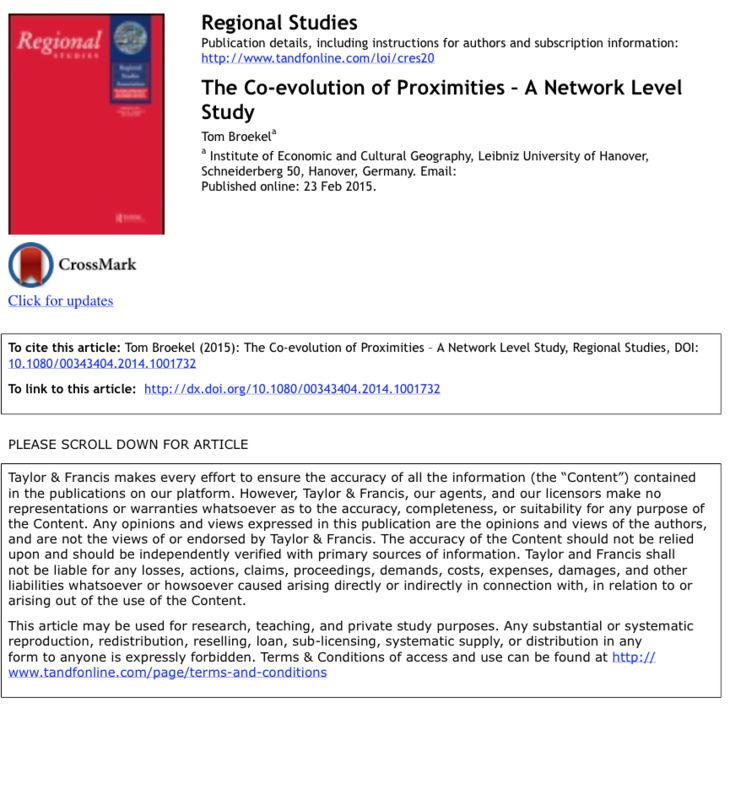 My paper „The co-evolution of proximities – a network level study“ has been published in Regional Studies. It can be downloaded here. Theco-evolution of proximities – a network level study, Regional Studies. Little isknownabouthownetwork structures and proximity relations between linked actors evolve over time. This paper argues that a number of networks’ internal proximity structures are interrelated, which may give rise to specific types of co-evolution dynamics. An empirical investigation tests these arguments using information on the evolution of 280 networks of subsidized research and development (R&D) collaboration in Germany. The empirical findings clearly confirm the existence of systematic and dynamic interrelatedness between proximities. In this way, the paper underlines the need to consider such relations when investigating the evolution of knowledge networks. This entry was posted in publication and tagged co-evolution, network, proximities, R&D collaboration. Bookmark the permalink.